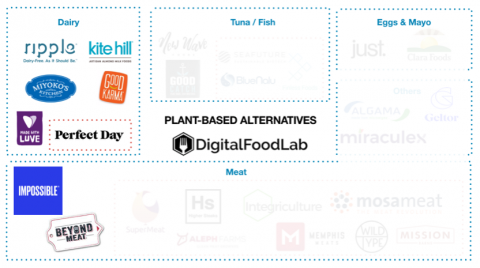 In 2018, FoodTech has become even more serious, which will be a record year in terms of investments with huge rounds (and whole lot more Food unicorns). This year was also a decisive tipping point in the way corporates and VCs were looking at the domain. 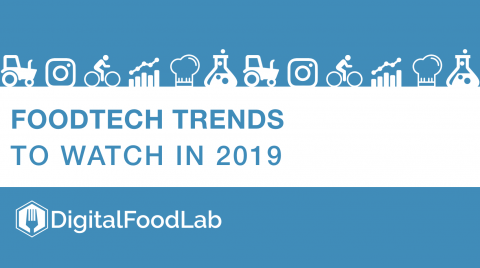 For the later, while FoodTech was mostly a synonym for delivery startups, it is now looked more broadly with interest as a domain with tremendous potential. For food and retail corporates, 2018 has been the year were most have understood that their citadel wasn’t impregnable and that “something is happening”. 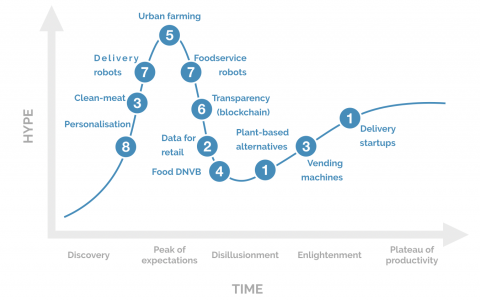 Time: meaningful tech trends tend to evolve around 6 phases from technology trigger (discovery), a peak of expectation (everyone is talking about it without having seen anything), disillusionment, enlightenment (when profitability and mass use seem reasonable expectable) and the plateau of productivity (when everyone is using it).